We have not been covering the budget cuts in NYC because there's been so much coverage elsewhere, especially on the NYC Parent blog and listserve. Leonie Haimson writes (note her comment on the NY Times as MIA). I want everyone to read the excellent editorial in the Queens Chronicle – far more on target than the NY Post or the Daily news– both of which have written intemperate, inaccurate and biased editorials about the budget cuts to schools, blaming the City council and the State Legislature respectively, instead of where the true responsibility clearly lies – on the shoulders of the mayor and the chancellor. The Chronicle editorial is also far better than anything that the NY Times is likely to write on the subject. The Times editorial page, as usual, continues to be missing in action on this and nearly every other important issue that relates our schools in this city. The young guidance counselor smiled proudly and handed him the paper." The conga line snakes around the arena. 450 kids from 24 countries on five continents. We are in Tokyo. The children are between nine and 17 years old and we are at the end of three days of competition at the Asian Open FIRST LEGO League tournament. The kids are from Peru and Brazil; a bunch from the US, Canada and Mexico; five from China; teams from Malaysia, Singapore, Taiwan, Korea; many from Western Europe – France, Spain, Germany, Holland, all the Scandinavian countries; and Turkey, Egypt, Saudi Arabia. We were disappointed to hear the two teams from Israel had to cancel at the last minute - we could have solved the Middle East in those three days. Tomo, the English speaking student, who ended up being my ref partner throughout the tournament – thank goodness – after I made sure to recruit some of the Europeans to join us. It turned out many of them were in my boat – helping organize and run tournaments but never having time to learn the intricacies of the game. This year’s theme was energy – the Power Puzzle – and teams also have to do research on solving the energy crisis and do a presentation in front of a panel of judges. So, things were a bit chaotic and on the first day we didn’t get out until 8 PM. Later that night a group of us gathered in the lobby going over the rules until 11 PM. I marveled at the fact that here are adults spending hours working on this stuff and taking it so very seriously to make sure it goes ok for the kids. But that is what working with FIRST robotics is all about. The refereeing went pretty well, though there were kids from two Chinese teams pretty mad at Tomo and me for some of our rulings. One of the kids spent a half hour arguing with me and I told him he should be a lawyer. The next day all the kids came over to take pictures. Having this kind of contact with kids after so long an absence was the great benefit of the trip. It is the major thing I miss about teaching. We had two contrasting NYC middle schools - one public school (Herman Ritter) from the South Bronx and the other a private school (Little Red School House) from Manhattan where the kids raised $1200 in bake sales to assist the Ritter kids in getting to Japan. Ritter returned the favor by taking Little Red to dinner in Tokyo, the idea of Bronx FLL organizer Gary Israel (my roomie) who has been instrumental in promoting the Ritter kids. This trip turned into a unique opportunity to interact with a great variety of adults and children from all over the world. I was fortunate in having Marcio Noguchi as a traveling companion. Marcio, of Japanese descent but born and raised in Brazil, lived in Japan for nine years. He now works for Credit Suisse in New York, so he brings a perspective of three continents to the table. We spent a lot of time together walking miles around Tokyo, so I got some great insights, illuminated after a sampling of sake at one restaurant. Afterwards, we went staggering – er - looking for ice cream and not finding a place, ended up at an all night McDonalds for shakes. It is a five story vertical place with stools at counters where some people spend many hours studying. Marcio left his motorcycle in my driveway and some of my neighbors were concerned that I was going through some kind of phase. The remarkable Jeanne Dupont, who heads the Rockaway Waterfront Alliance and organized the 2nd annual Earth Day on May 3 (two days after I returned) asked me to set up a display of the Power Puzzle for the event. (Native Rockawayite Bob Woods from LEGO Education also had a display on building solar cars.) Despite somewhat iffy weather conditions, we were visited by some of the local schools that expressed an interest in FLL robotics for next year and I hope to be able to assist them. Registration for Climate Connections, this year’s theme, is already open. FLL is not just for schools, but also for clubs and neighborhood teams. We even had a NYC Parks Dept. Team from Staten Island this year. Contact me if interested. I retired six years ago because I wanted to have the time to do other things. I had been in a pretty cushy job for the previous four years in computer support and didn’t feel the need to go, other than time was a-wasting. FIRST robotics was the first thing I did and have been handling registration and team recruitment ever since. I also have been deeply involved in educational and union issues and other activities, mostly Manhattan based. In the past year or two I have been getting more involved in local activities in Rockaway. I’ve been doing a lot of video work along with my friend Mark Rosenhaft (NorMark Film.) Last night I attended my first local Planning Commission meeting videotaping with filmmaker Jennifer Callahan for the upcoming “Bungalows of Rockaway.” The major issue was the sometimes controversial re-zoning plan. In a very crowded meeting, there were lots of illuminating things going on, with some East/West Rockaway fault lines showing their cracks. It would be beneficial for more people to find ways to work together. A group of Manhattanites have become part of the east end community as bungalow owners and that adds an interesting dynamic that bears watching. Mark and I spent a year as co-producers, editors and cinematographers on “Dispatch,” a film that will be shown at the upcoming Rockaway Literary Arts and Film Festival. That experience made me more aware of local events that are worth getting involved in. We recently interviewed The Wave’s Howard Schwach for a segment on Manhattan Neighborhood Network. When I showed it to the group I am working with, one of the people said, “I did the interview with him for Channel 4 when the plane crashed in Rockaway.” She is Rita Satz, who worked as a producer on the Today Show and is now retired. She has roots in Rockaway and is interested in producing the segment on Schwach. Through the “Dispatch” film, I met Rockaway Theater Company’s John Gilleece who played a role in the film. John said RTC was looking for a videographer to tape the shows. I taped every show last year, sometimes twice. And I saw them gain when I worked on making the DVD’s. I could have watched them ten times. Seeing the shows from the booth and through a lens provides a unique perspective. Not a bad moment in any of them. Great acting, sets, spirit. There’s nothing not to like. Having taught, my favorites are the shows with kids. Last year’s “Oliver” blew me away, not only for the quality of the show but for the way the kids were treated and how they responded. In addition to everything else, RTC does some remarkable teaching. I’ve been around the “Annie” production from the first auditions back in January and never fail to be amazed at the kids and the adults working with them, especially co-directors Kathy Valentine and Frank Caiati. I need another column to describe the work Kathy and Frank do. (They also help paint the props.) They help create some of the remarkable spirit and energy that infuses the Rockaway Theater Company, where everyone – kids, parents, adult actors, etc. pitch in, from cleaning the theater to selling snacks during intermission. How such a small geographical area can nurture so much talent is astounding. I can testify that Frank is a remarkable teacher, having recently completed an acting class with him. And he is also a great actor. The kids are lucky to have him around, at least until he makes it big on Broadway or in film. I saw “Annie” with a large group of friends last Saturday, some first-time RTC-goers. They will be back. I went back on Sunday to tape it and am going back this weekend to tape it again. I won’t be bored for an instant. One of their leaders, Leo Casey, seems to have no problem finding time to writing on EdWize, the UFT blog, long, very long theoretical critiques of G. William Domhoff’s analysis of the power elite. This is something I’m sure his rank-and-file members have been salivating to read. Yet not a word about Doug Avella and the students of I.S. 318. We're sure the UFT is doing what it always does in cases like these: provide a rep and inform the teacher of his rights, which as a probationary teacher are few. They will claim they are negotiating behind the scenes and therefore must remain quiet. WHAT DID MR. AVELLA SAY AND WHEN DID HE SAY IT? What about the public aspect of the situation? That a teacher discusses an issue with his classes, the kids take some action, and the teacher is immediately blamed and sent to the rubber room. Remember. The kids have supposedly taken 22 standardized tests this year and this was one of those practice types that ARIS, which is not working effectively, is supposed to deal with. It seems the UFT should use its pulpit to shout about this case loud and clear. They may very well argue that publicity would hurt the teacher. I disagree. His best chances would seem to come from embarassing the DOE to the extreme over the use of Gestapo tactics against the kids and teacher. Sounds like no harm, no foul. Sources tell us the children were threatened with No GRADUATION or PROM if they didn't comply and rat the teacher out and Avella's program is being covered by a substitute. Is it a good thing for the kids to lose a popular teacher at this point in the year? And what of the bigger lesson of threats and intimidation? Where's the outrage at the violation of these children by the system? Anyone out there in the regressive reform movement who are so concerned about achievment gaps in the abstract? BRING AVELLA BACK TO HIS KIDS FOR THE REST OF THE YEAR FOR THE SAKE OF THE KIDS! Where's the NY press which is always talking about how much money is being wasted by the rubber room? Do you get a clue why teachers need tenure? If Avella had tenure he would be in a much stronger position. In fact, when Joel Klein and the regressive ed reformers try to make the case for the elimination of tenure, respond with these two words: Doug Avella. ...or so goes the UFT/Unity line. But they undoubtedly support a Clinton protest in Washington to seat the Michigan and Florida delegations because that is democracy. The cracks in the divided Democratic Party just got a little deeper. So what if it divides the Party? Maybe the Democratic Party needs division. I don't object to a protest. More democracy, I say. It is the hypocrisy of the UFT leadership I object too. When ICE and TJC ran campaigns against Randi and the 2005 contract: DIVIDERS, AGENTS OF BLOOMKLEIN were hurled at us. Remember when Randi tried to run unopposed in 2004 by buying off the then opposition, New Action? That was why ICE got started and worked with TJC to try to rebuild an opposition practically from scratch. Then when we won 6 out of 89 on the Executive Board they went crazy over having to deal with them and came up with a strategy to get even these 6 off the Board by co-endorsing 8 useless New Action people who sit there mute. But when it comes to Hillary, they will give you the holier than thou "Let the democratic process play itself out." Coming soon: Randi and Leo Casey attack me - on a blog in Chicago. 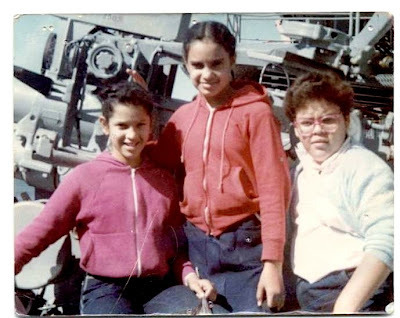 Fourth graders Maria, Daphne and Diane, 1981, most likely on one o f our (numerous) trips. Wednesday night's News Hour had a decent report on teachers, focusing on the NY State teacher of the year. She said some very good things. The report ended with the observation that when polled as to the thing they wanted most – no, they did not mention merit pay – teachers said they want to be thanked. At least once in a while. For me, it's been a long time since I was in a position to be thanked. I was a very confident teacher but over time I have forgotten what it was that made me so confident. Doubts have arisen as to just how good a teacher I was. Maria, in one of the 2 top classes I ever had, was among my 3-5 most proficient students. And probably the best math student ever. She doubted I remembered who she was. I told her when we spoke that I wouldn't forget one of the few students I had who went to Stuyvesant HS. Maria (and her friends) left a lasting impression on me. Her dad, who was an older gentleman (in a very embarrassing moment I asked him if he was her grandfather) was always there to bring her to school in the morning and pick her up in the afternoon – a wonderful gentleman, and in spite of Maria's giving me credit for stimulating her interest in math, the true source of that interest. I really think he knew more than me. She told me he died 4 years ago in his 90's. You hear the word "accountability," sure, like no one was ever accountable until the regressive ed movement came along. I always felt accountable – to the people that mattered most – the students and the parents. I couldn't care less what supervisors thought (unless I respected them.) A student opinion, especially after a generation, means more than any award or merit pay one can get. I bet most teachers agree. The last time I saw Maria I took her and some other students to a college prep class in Manhattan. She was about 17 and on the way to college. We're hoping to get together soon. In my search to find a good school for my 6 and 3 year old daughters, I started to recall my own elementary school experience. With that, it brought me to remember two teachers who brought something unique to the classroom and sparked my interest in learning. You were one of those teachers and Ms. DeMarinas was the other. I am sure that you do not recall the names and faces of all the children you taught over the years, but I am quite sure that you left your impression on each of them, as I am one of them. I was enrolled in your class as a 4th Grader in PS 147 in Brooklyn in 1981. Academically, I recall a wonderful multiplication table that sparked my love of math. I also remember that on Mondays you would assign us ten random words that we would need to incorporate into a storyline by Friday…that was my favorite! But it was your spirit and love of life that I remember best. In the mornings, you would select a few kids off the line to come help set up the classroom before school began. Getting called up to your classroom was something of the equivalent of getting waved over to Johnny Carson's couch…for that is when the magic happened! It was during this time that you introduced me to John Lennon, Randy Newman and everytime I hear Wherewolves of London I still think of you! You strived to inspire inner city children to a world outside of their own…and for some of us, it stuck. So here I am, researching schools and decided to google your name…and there you were! My name in 1981 was Maria A-. I was best friends with Diane and Daphne. We remain close friends to this day. I have attached a picture of the three of us in elementary school…and who knows, our faces might look slightly familiar to you. I am now a mother of two beautiful daughters and today I have come full circle as I begin to chart their academic lives! Hope things are well for you and it has made me very happy to be able to reach out to you today. Thanks to Susan Ohanian for sending these letters along after putting a shout out on her web site. And don't forget to check out her new book. Stephen Krashen writes: I have just received, and read, Ohanian's When Childhood Collides with NCLB. It is the kind of book that you read immediately, and easily. It provides an incredible amount of ammunition, at just the time we need it. Thank god for principled teachers like Douglas Avella, who is teaching his students critical thinking. He is exactly the kind of teacher we need. And his students are the kind of students we need, who have seen through the farce that is the testing madness, and who know there are better ways to evaluate both individuals and programs. Shame on everybody in your administration who discourages this kind of teaching and learning. Avella should be lauded as Teacher of the Year. You will be the laughing-stock of the country if you punish him in any way. Be a man; stand beside him to confront and resist the testing madness. Hooray, they have broken the apathy barrier! Right or wrong (and weren't we there ourselves once? ), right or wrong they have actually done something which will empower them for the rest of their lives. Will these students be among the 40 percent who do not vote? I bet not. Will they only look to others to take care of them? I doubt it. Will they go out into the world with excitement in their hearts and minds because they did something? Definitely. Consider for a moment the course they may take if you fire this brave teacher. They will be given the message that it is not worth it to try. They may feel that peaceful resistance is ineffective. They may decide to let the achievement gap widen on their account to pay back a system which misunderstood and devalued them. What do I know about this? I am the teacher who recently in Seattle refused to administer our state's test. Luckily, my district saw fit to only suspend me for two weeks. My place is in the classroom and so is your rebellious teacher's. Please show some wisdom and courage, and pay attention to your student's voices and the voices of concern from people who are supporting them and your teacher. This is one educator who is proud of the direct action the students of the South Bronx Middle School. They see clearly that putting the cow on the scale AGAIN won't make them any smarter. The misuse of standardized tests are corrupting public education and THE only benefactor of testing is the test publishing companies. It is sad to put the blame solely on their teacher. But even if he was the impetus for the idea, it was a good idea. However, as a professional educator, I know from first hand experience that middle schoolers aren't likely to be led in this action, but are much more likely to be the leaders. Perhaps they are tired of taking tests that do nothing but highlight their socio-economic status and fail to enhance the quality of their education in any way. Perhaps when the leadership of the New York City schools recognize that schools aren't a worker delivery factory system, but rather a place of education to prepare students for participation in our democratic republic, then perhaps the requirements for teachers to commit educational malpractice will also cease. — Sean Michael Black, M.A., Ed.S. But the law is NOT working, standardized tests do NOT improve learning, and that children, when faced with these test anxieties, have dramatic brain changes that block them from truly learning and RETAINING information. Those students at that school were tired of the testing and the military regimentation of the curriculum that they were facing. You need to realize this as these students were brave enough to say ENOUGH IS ENOUGH. Do NOT fire this teacher for the actions of students in pain. As a longtime middle school teacher, I applaud what happened at Intermediate School 318. When children of this age examine a problem and then organize to effect change, then we know that citizenship in a democracy is indeed alive and well. It is indeed gratifying to see students able to break out of the factory model for schooling and stand up for a good education. I would be proud to be their teacher. Our nation needs more teachers like Douglas Avella. This blog has been pretty rough on Hillary Clinton, but this flack over her RFK assassination issue is a case of piling on. How can any of us who lived through 1968 forget any of it, especially since we were so young at the time? 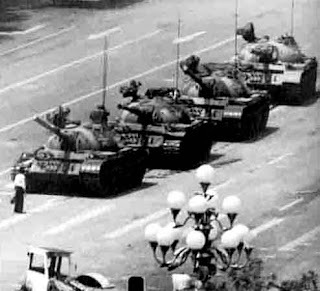 That it's exactly 40 years later with so many similarities is so freaky. I don't think she was making a bad point. I am not an outright Obama supporter and think some of his stuff is pretty conservative, but I will probably vote for him, as opposed to some more left Green party or even Nader. Let's not forget that Hillary has about 50% of the Democratic Party support. And, no, I do not think she should drop out. Why not take it to the convention? Lincoln won on the 4th ballot and I don't think he led on any of the first three, running 4th initially. Will all this help McCain? Maybe, maybe not. I'm for the most democracy we can have. Now, if only the Hillary support network led by the UFT would allow a bit of democracy to shine so Obama supporters get to say their piece. Oh, and let's not neglect to mention the shameful performance of Unity Caucus lapdogs New Action Caucus, where some of their members furtively pass around anti-Hillary literature but remain silent at Executive Board and Delegate Assembly meetings. ... last week where Simon Doolittle asked me many of the same questions Charlie Rose asked Randi Weingarten (her video here). I think I did a better job than she did (which was not hard.) And future journalist Simon did a better job than Rose in framing the questions and we engaged in a very stimulating dialogue. I don't know when (or if) the interview will be posted, but check out the work they do over at After Ed: http://aftered.tv/. Check out Simon's "The Education of John Deerdon" in the featured video section. I asked Simon my own questions. Did he believe Deerdon's difficulties were due to lack of literacy or the achievement gap in general? In other words, would John Deerdon have gone to college right out of high school if he had been in, say, a KIPP school? Or would the streets have gotten him anyway? I asked Simon these questions because of the number of my former students who were not behind academically at the elementary school level and certainly had the tools to succeed in school, but ended up not doing so for so many reasons beyond school and why the closing achievement gap focus is so narrow a way of attacking the problem. I mean, how many former students who you had great hopes for have to end up in jail or become pregnant at 14 for you to say, "Houston, we've got a problem. And it ain't soley due to the achievement (gag) gap. You have most likely heard about the situation in the Bronx at IS 318. On May 13 six classes of 8th graders staged a boycott in protest to being forced to take another standardized test, one of over two dozen this year. They boycotted one of the practice tests. An 8th grade social studies teacher, Douglas Avella, was falsely accused of instigating the students to boycott, and he is already in the rubber room and likely to lose his job entirely. Over the past week, a number of news articles and editorials have come out, including coverage from Juan Gonzalez and on WBAI's Democracy Now, and there has been a huge outpouring of concern and support for the teacher and the students. Recently, there have been a few other cases of testing boycotts in other U.S. cities, but this is the first one that we have heard about that was initiated by students. The students of I.S. 318 thought critically about their education, organized with each other, and then decided to take action. Their actions should be celebrated. The students and their teacher should be applauded and their message of urgency about the current state of high-stakes testing in our schools taken seriously. We need to let the DOE know that we need more teachers like Douglas Avella. We need more educators who listen to their students, take their ideas and experiences seriously, and make it possible for them to respond thoughtfully and critically to their world. Let him know that we demand the immediate re-instatement of Douglas Avella to his teaching position at IS 318 and the removal of any negative letters or ratings in his file in connection with the test boycott. I worked for what I would call a semi-despot in that she wanted everything her own way - contract be damned. Not an educator in the sense of ever having taught much at all, but a political appointee - yes we had them in the 70's – she also never letters in the file or looked to cost someone their job. If you were sick she went all the way to support you (she would be vilified by Kleinites today for things like that.) Her dad was a fireman and she believed in unions - as long as they didn't interfere with her. 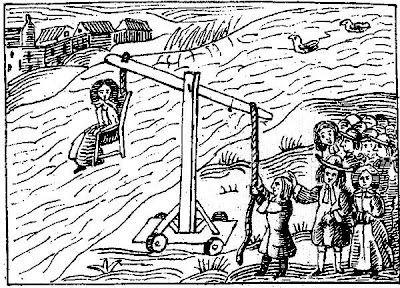 There were also lots of abuses - like favors for those who "cooperated" the unfairness of which used to drive people wild. Really, a complex person who had a lot of good to go with the bad. It was her way or the highway and she was relentless in getting her way. Most of us had to stand by and watch the dumbest educational decisions being made and enormous sums of money wasted. We even had those practice high stakes tests Klein is pushing backin the 90's (without Aris). When I became chapter leader, I saw it as my job to make the school a more democratic place to work, with a lot more transparency and the enforcement of teachers' rights. I was not a grievance nut and in fact filed maybe one of two in my 3 active years on the job. That was mostly due to teachers not wanting to deal with the relentless retaliation that would result. I bore a bunch of it but used my chapter leader newspaper (the predecessor to Ed Notes) very effectively to provide information to the members about what was going on. The paper (including jokes) was read by everyone, including parents. She would go to principal meetings and say she had the chapter leader from hell. I tell people all the time - publish, publish, publish. It is the most effective way to fight them. Even say good things sometimes. And keep them confused and on the defensive. Since they couldn't go after me on my teaching, they went after my computer program, which I had built from scratch. Finding that most of my colleagues did not have the stomach for a prolonged struggle, I took a district tech job offer when it came, to which my principal celebrated with this statement to my new boss, "My car was stolen today, but this makes up for it." Funny thing is, I was assigned to cover the school for tech support and once I was no longer teaching there, she greeted me with a kiss and a hug when I came around. And even gave me money for Ed Notes (which began life as a weekly school chapter report focused on her leadership. When I see her I call her the mother of Ed Notes. Believe me, most teachers who worked for her would take her over 80% of the principals we hear about today (her Leadership Academy replacement is despised). She wanted her way but backed teachers (even me when I had an incident with a kid) 100%. After what I hear today, if I saw her I would give her a big hug. And so would most of my former colleagues. While known for attacks on teachers (which seems ok to the anti-teacher world out there) the Bronx High administration under Reidy has also engaged in attacks on students and parents. I became personally involved with a Bronx High student not long ago when he contacted me through this blog for assistance and advice. 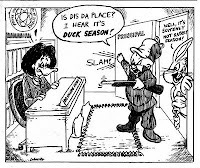 Charged with the horrendous crime of bringing up the cartoon you see below on a school library computer (which the student denies doing), he was threatened with suspension and even expulsion. He was in the midst of studying for an AP exam (and he's only a sophomore) and was very concerned about the distraction over the incident. I called Advocates for Children, who did not have someone available to go with him to a hearing at th e school where he had to bring up his parents (imagine, his parents had to take a day off from work over this nonsense.) He asked me to go with him but we felt that might prove to be provocative. I had him talk to some te achers and admins I know at the school to get more advice. I can't tell you how impressed I was with this student, as we had many email and phone conversations. He even contacted the chancellor's office and they punted it right back to the school. But his idea to not take it lying down was what kids should be learning, though he ended up with a one day in school suspension and no entry on his permanent record, which he felt ok about – maybe it was fairly light because the story had gotten out of the box. We talked about the bigger lessons: you don't always have to take the crap, but when you think you are getting a good deal, take it. I think we may be hearing some great things about him in the future. 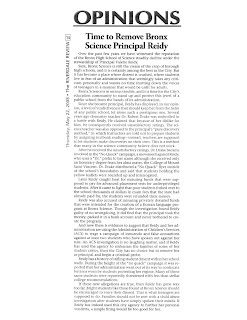 We've been following the Bronx High Quacking story here and here since we were contacted by Dr. Bob Drake*, a chemistry teacher who was U-rated and fired for starting the "Reidy is a Quack" campaign when she started calling herself "Dr." after receiving an honorary PhD. There were always principals who abused their power - from the days I entered the school system and before. Empowered principals under BloomKlein and the eviscerating of the UFT Contract have made things much worse for teachers, students and principals, but expect the Klein apologists to attack the victims. To the Regressive Ed reformers, whatever a principal says and does, even if he/she rolls steel balls around and talks about stolen strawberries, is ok. The teacher is always wrong. If you are the best teacher but show disrespect to the monarch, it's your head and sadly, there are actually totalitarian-like people out there who think teachers should lose their job for reasons that have nothing to do with job performance. The rubber rooms are loaded with them.
" I am writing to inform you of my resignation effective today, November 10, 2006. Although most of the staff, particularly the young and untenured, are in mortal fear of even having a conversation with you to discuss issues pertaining to their professional lives because of your infamous reputation for “dismissing” staff members that question; I am confident that this drastic step has earned me the right to a fearless, legitimate opinion which will shed light on the severity of how teachers are treated under your administration. So do you check your first amendment rights at the school door? If a principal behaves in ways that are outrageous, what is the recourse? In a so-called democratic society, the actions of despotic principals is not acceptable. Look for my follow-up post (to come) on my own experiences as a teacher and chapter leader with a semi-despotic principal. After hearing the stories today, the next time I see her I will give her a big hug. * We went with Bob to a PEP meeting where he presented his case to Joel Klein's deaf ears who ignores the fact that there are U-rated teachers for political reasons. After Bob left, he found that many school districts outside NYC were very happy to have him teach, and at a much higher rate of pay. Amy Wilkins at the Education Policy Blog. Oh, did I tell you it is funded by Bill and Melinda? Wilkins is becoming a celebrity (funded by Gates, another celebrity), traveling the country encouraging people to “jump on the bandwagon” that America’s public schools are failing and must be saved via standards-based reforms. Also the % of Hispanic teachers has dropped from a high of 18% in the mid-90's to 11% today, though the numbers are fairly consistent under BloomKlein and the drop began before they took over. At the height, Hispanic an African Americans mader up over 40% of new recruits and that has dropped to 25%. And the % of white teacher recruits has risen from 49% - 65%. I'm not quick to charge racism and would love to get some analysis to explain the drop. Teach for America - what % of the recruits are black? Teaching Fellows? I thought Tweed was claiming a higher % than 14%. Cuts in college programs? Less kids going to college from the very community BloomKlein was supposedly targetting? Maybe we just have to wait for all those KIPP kids to go through college. Another explanation is the loss of paras who were in the career ladder program to become teachers. Check the original Sam Anderson post at this Teachers Unite site. DOE data shows sharp drop in % of black and Hispanic teachers hired since 1994. Studies show that the students of a different race than their teachers have worse outcomes – except in smaller classes, when racial disparities no longer appear to have an effect. Black Educator: NYC's Disappearing Black/Latino Public School Teachers. Teachers Unite: How have the demographics of New York City's public school population, among teachers and students, changed since you've been involved in education? Sam Anderson: Over the past 40 years New York City's public schools have gone from being comprised of predominantly white students to one that is now predominantly Black, Latino and Asian students. However, when we look at the racial breakdown of the teaching and administrative staff, they are still overwhelmingly white to the point that nearly 80% of the teachers are white. All we have to do is look at the Department of Education's own data. More specifically, when we look at the sixteen year record of the racial breakdown of new hires, we see the re-enforcement of white teacher dominance clearly built into the DOE's personnel structure. Below are the data from the DOE about new hires (this was not easy to come by. But thanks to the persistent work of an Amsterdam News journalist, it is now in the public light). Today's DOE new hires are more skewed towards white teachers than 10 years ago! This is clearly a reflection of the mindset of the top DOE officials who surround themselves in Tweed with white professionals and Black & Latino supportive staff (from security to low-mid level administrative staff). In addition, this high level staff is dominated by non-educators... from Klein on down to the mid-level corporate-like structures overseeing the actual nuts and bolts of the schooling process. EDN News reports that a recent study of demographics in the UFT show that 97% of the members of the UFT hail from Appalachia, thus explaining the total lack of Obama supporters in the NYC union. I started attending some workshops on Friday as part of an introduction to engineering at Polytechnic U in B'klyn as part of a DOE grant - it was a small group but most were elementary school people. The prof who is a major guy at Poly was defining the profession of engineering and contrasting it to what people think engineers are - like building maintenance people -- in other words, trades, which he said people can learn in less than a year at a trade school rather than paying $100,000 or more for a degree in engineering. Examining the criteria for a profession: design tools and know what tools to use. Knowledge is applied with experience, study and practice and judgements are made based on these factors. I raised my hand and said that by these criteria, teaching in public schools today is a trade, not a profession. He disagreed, saying teachers should control their curriculum, etc. Not in today's world of deskilling teachers where major newspapers and ELA exams extol the benefits of having little experience or real training. TFA is one of the major instruments in this process - making teaching a true trade where you can go to TFA trade school for a short time - like learning data entry. Ultimately, when the merit pay schemes are in place where a small percentage of teachers will earn bigger bucks with the rest at much lower pay - the idea of a trade will be complete - except people like plumbers will always make more. My advice to potential teachers - try plumbing instead and enjoy a trade that will pay. When I hear that we need to close the achievment gap to keep up with the global economy my response is train plumbers instead. Plumbing is impossible to outsource. Wolf should have spoken of state scores in this context. The gains under Crew and Levy from 1999-2002 were larger on the state tests in both reading and math, than under Klein from 2003-2007. On the NAEP, there was a large gain from 2002-2003 in fourth grade reading. From 2003-2007, the reading scores in fourth grade and eighth grade have been flat. I'm not going to jump on board in elaborate praise for Crew and Levy as their "reforms" so lauded by the UFT, were no more than bandaids. The Wolf piece is posted at Norms Notes. Robert Jackson is the opposite of somnolent – he is the most active, energetic and committed critic of the DOE and has held countless hearings to point out the flaws of their policies. Moreover, he also provides tremendous support to parents and advocates. On the other hand, Eva was and remains brilliant at getting publicity. UPDATE: Finding Your Entrepreneurial Core: 24 maxims for becoming an entrepreneurial teacher. The Eggplant follow-up to a recent Rhee's speech. It is interesting that Randi Weingarten actually talked about Rhee, though not exactly critically or in a mild form, at the last Delegate Assembly - clearly in response to some of the blogging going on, unusual in that Randi likes to make it seem the battle is between Klein and her, not nationally. But with her move to that stage she will have to deal with it. The recent contract demands by Rhee to give her total control over moving people around should be loudly condemned by Randi as an extremely dangerous precedent. But she won't. It is important to connect the Rhee stuff so teachers in NYC see a connection and don't allow Unity to keep the debate to "oh, when we elect the new mayor all will be well" -- they way they will try to extort more COPE money. Note how Rhee appears at so many conferences (as does Klein) - they could be in schools really seeing whats' going on but the political agenda is what counts. Read Ednotes' last posting on Rhee, "Rhee, the Monster of DC, Soon to Follow, the UFT." 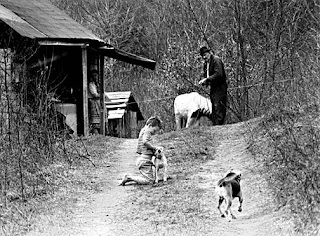 ... the debate begun by A Voice in the Wilderness continues at Eduwonkette. where Skoolboy digs out the rubric and even includes Wendy Kopp's speech. Are test makers using product placement to push their agenda? ...provide health services to students at each large high school. A doctor, dentist, some full-time nurses. That would be as important in closing the achievement gap as any other lame brained idea the Regressive Ed reformers are pushing. Another in a series of true reforms that would have a long-term impact brought to you by PER. I got this link from Russo's TWIE. Blogger Maureen Trantham in her "Great Moments in the Teacher Quality Debate!" 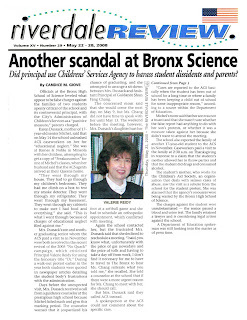 reports on how Ed Trust's Amy Wilkins practically assaults former Teaching Fellow Dan Brown at the Ed in '08 conference. See the video and come right back. But you know something? Amy is right when she is critical of Brown's being thrown as a first year teacher with the poorest, neediest kids. She doesn't go after Brown per se but the policy makers that allow this. Hmmm! Are we talking about Teach For America, here? Wilkins and the Ed Trust are part of the reform crowd that believes we close the - and do I hate these words - achievement gap without investing resources. So does she mean let's give TFA and Teaching Fellows an internship in schools so they can really learn the ropes. But that costs money. So the "reformers" want to do it this way: kill union contracts to the extent that veteran teachers can be moved around like chess pieces. Supposedly that was what Klein claimed he wanted to do - to put the best senior teachers where they are needed,which turned out to be bogus when he launched air strikes on senior expensive teachers. Dan Brown's defense on the video is not strong enough, offering no alternatives to a system shaped by the powers for their own needs, which is to plug a poorly trained (and cheap), de-skilled (so they can interchange parts) teacher into a slot in a poor neighborhood. Oh what to do when schools in poor neighborhoods are a short staffed? Use TF and TFA's but really get them ready to teach. Stop taking short cuts. UPDATE: Fred Klonsky slaps Leo Casey. One of the most remarkable, almost a miracle one might say, undercurrents in this Hillary-Barack battle where the entire Democratic Party has split down the middle, has taken place in the United Federation of Teachers where 200,000 members support Hillary Clinton – unanimously. Even more remarkable has been the reversal of what is happening nationally: 90% of black voters support Obama, yet not one single black Obama supporter has emerged in the UFT. Nationally, Clinton gets the older, blue collar and less educated vote while Obama gets the younger, white collar, college educated vote. Not in the UFT, which everyone would agree is not only white collar and college educated, but has had a massive influx of young teachers. Again, not one Obama supporter amongst these demographics has been spotted. Likened to the way Hasidim vote en masse in elections, the membership has followed the lead of Randi Weingarten in one of the most remarkable operations in political history. ...they are going to stay behind. Does Obama "get it" that closing the achievement gap will take a lot more than threats and punishments of schools, teachers and children. Obama video on education at the Educator Roundtable. Teacher Doug Avella from IS 318 in the Bronx is in the Rubber Room (let's hear it from the peanut gallery in the press and the national teacher bashers about only incompetents being in the RR) for doing exactly what? Talking about testing to his kids? And 160 kids in 6 classes just pick themselves up and boycott the 22nd standardized test they took this year? You mean a teacher in middle school in the Bronx actually got 160 kids to do what he wanted them to do? Someone has got to be kidding if they think it is that easy to move THAT mountain. Question on ICE-mail: Will the UFT back up this teacher? You're kidding, right? The UFT will backup this teacher right into the unemployment line. Sure, they will provide an advocate to represent him at the discontinuance and U rating appeals but do you think they will file an Article 78 in Court challenging his dismissal? Not a prayer. Joining teachers from North Carolina (video) and Washington State. Hey, TFA people! If you are going to leave after 2 years anyway, why not go out in style? Dan Brown's take at the Huffington Post. "We've come to realize we're going to have to give in to her." - anon. union member is D.C.
Washington D.C. schools Chancellor Michelle Rhee, who spends a hell of a lot of time racing around from ed conference to ed conference pushing the national regressive "teachers and their contracts are the problem," seems about to claim a major union scalp that goes beyond what her former boss Joel Klein has exacted in NYC. The Washington Post reports (full story at Norms Notes) that a total end to seniority and tenure is afoot which will allow Rhee to fire anyone at will and place teachers in whatever school she wants. This is the nirvana the ed reformers wanted all along. The next step for Rhee, a former Teach for America, will be to replace most of the teacher corps with 2 or 3 year wonders. The acceptance of these provisions in exchange for a big raise should be familiar to UFT'ers in NYC who saw significant parts of the contract get sold off. We know some form of this will be coming soon to NYC. The D.C. union, being an AFT local (which had serious corruption issues a few years ago that severely weakened the union) should be of concern to upcoming AFT President Randi Weingarten who one would wish would loudly condemn such a provision but we know won't do so. Weingarten, who mentioned Rhee and the national attacks going on (we have been hammering away with this theme for 7 years) at the May Delegate Assembly, will no doubt say the doesn't want to interfere with local contract negotiations. That the AFT local doesn't really exist in New Orleans should be a warning to her that her membership may be stripped away piece by piece. But no worries. As an appeaser of the highest order, as pointed out by NYC Educator, she will make enough concessions to convince the powers that be that she is a player on their side. This is the so-called cooperative, rather than militant New Union movement, which Weingarten and ideologue Leo Casey have been pushing. "We want to cooperate in the reforms because we are professionals, not common workers. Contracts are passe anyway." I'm at the point now where I am almost hoping Rhee gets whatever she wants. In 5 years or more when nothing has changed in terms of real educational gains (oh, they'll do the same phony stat manipulation they do here in NYC) they'll have to look for new scapegoats as a way to escape doing truly progressive reforms like lowering class size, improving the health of poor kids, etc. – things that cost money that must be reserved for wars and bailouts. I know. Aliens have captured the minds of the children and we must invest in a defensive shields. 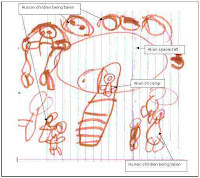 A future quote from Rhee, Klein, Rotherham: "Before we can lower class size, we need a quality shield to protect children from alien mind control over every school." Many good teachers - if not more - leave the system or are promoted out of the classroom each year. But poor teachers leave too, an awful lot of them becoming supervisors. The repl acements will fall into the same bell curve, especially first year teachers. So focusing all the reforms on removing them from the system is a losing game and the right wing and Dems 08 and Ed Sector types are using the quality teacher issue as a diversion. On good teachers, we are not saying they are not important - but the witch hunts and the use of barely trained newbies does nothing to improve the overall teaching core while we think lower class sizes and some kind of internship for newbies would lift all boats. Teachers should take a good look at their school and all the schools they have been in and make a list: great, good, average, poor, horrible and I just can't tell. When it comes to bad teachers, In fact fellow teachers don't really know all that much. You know who does? The kids and their parents probably have the best feel for a good teacher than anyone else. Think back to the teachers you had and rate as many as you can remember on a scale from 1-5 in terms of overall quality. Would you give the highest ratings to the teachers of classes where you scored very high on regents? Maybe. If you do well in school, you feel better about the teacher. Thinking of yourself as a student might give a much better insight into quality teaching than viewing it as a colleague. Or a supervisor. A supervisor's list of who are good and bad teachers might look very different. If you are a parent, think about the teachers your children had and rate them? Based on what? How happy your child was? Grades? How they related to you? We might get the better insights into teachers from students and parents than almost any other method. Yet they are totally left out of the equation. I know someone who visits many schools all over the city and always checks the pulse of the principal to see what they think of BloomKlein. Overwhelmingly they trash Tweed . At which point, they are urged to check out the ednotes blog. Scientific survey? That's pretty good for me. But Leonie Haimson of class size matters and Emily Horowtiz from St. Francis College have turned chatter into data. But, as I pointed out, word of mouth from sources throughout the school system is that other than the newly cloned Kool-aid drinkers, most principals despise Tweed. Fear has kept them from speaking out publicly, though with BloomKlein about to sunset, more are doing so. Those lame ducks are flying closer to the sun. Just watch the flood when the ducks have issued their final quack, though fear of Bloomberg retaliation may keep some people in line. One thing is as true as salt. The national press and ed wonk blogging cammunity will ignore this report as much as they have ignored the outcry from teachers and parents about how BloomKlein have turned a dysfunctional system into a catastrophy with failed, self-serving policies and bumbling implementation. At the least, one would have expected some level of competence from the so-called technocrats at Tweed. But they get almost nothing right. Please reply to this email if you would like a pdf copy. Fifty-four percent of principals say that the enrollment at their own school is not capped at a level to prevent overcrowding. Fifty percent say that overcrowding sometimes leads to unsafe conditions for students or staff; 43% observe that overcrowding makes it difficult for students and/or staff to get to class on time. Nearly half (48%) of respondents believe that the official utilization rate of their own schools as reported by the Department of Education is inaccurate; more than half (51%) of principals whose schools are reported as underutilized say that the official rate is incorrect. Eighty six percent believe that class sizes at their schools are too large to provide a quality education – and that the primary factors that prevent them from reducing class size are a lack of control over enrollment and space. More than one fourth (26%) of all middle and high school principals say that overcrowding makes it difficult for their students to receive the credits and/or courses needed to graduate on time. At 25% of schools, art, music or dance rooms have been lost to academic classrooms; 20% of computer rooms have been swallowed up; 18% of science rooms; 14% of reading enrichment rooms, and 10% of libraries have been converted to classroom space. At 29% of schools, lunch starts at 10:30 AM or earlier; and at 16% of schools, students have no regular access to the school’s library. 18% of principals reported that their schools have classrooms with no windows. Many said that special education classes and services were being given in inadequate spaces, including closets. Principals also reported ongoing battles with DOE over their schools’ capacity ratings, and expressed resentment at being assigned excessive numbers of students, particularly when they tried to use available funding to reduce class size. Many observed that the problem of overcrowding has been exacerbated due to DOE policies: 27% said that overcrowding at their schools had resulted from new schools or programs having been moved into their buildings in recent years; and several reported that the decision to add grade levels in order to create more K-8 and 6-12 schools had led to worse conditions. As Council Member Robert Jackson, Chair of the NYC Education Committee concludes: “We've known for years that official statistics on overcrowding and capacity were wrong but now we have hard data to show just how wrong. It doesn't take a rocket scientist or a multi-million dollar no-bid consulting contract to see that the current capital plan and budget cannot even begin to remedy the conditions described in this survey - facilities that fail to provide the setting for a sound, basic education. In light of this information, we will be looking and listening especially hard to DOE and SCA testimony at tomorrow's budget hearings on the capital plan." Finally, I thought at last night's UFT Executive Board meeting when I spotted the words "authoritarian regime... denies its peoples fundamental rights" in a proposed resolution. And Leo Casey was actually going to be the one to motivate it. UFT members to have free and unfettered access to the membership so a free exchange of ideas can occur. To allow free and open discussion at UFT delegate assemblies – maybe even allo w Obama supporters to make their case. To allow people in high schools and middle schools and elementary schools to elect their own Vice Presidents. Then I read on. It was China they are talking about, not the UFT's Unity Caucus. Whereas the ruling junta in the UFT recently rejected attempts to collect funds for the 17 Puerto Rican teachers who were fired for striking and defying the PR version of the Taylor Law. Whereas that same ruling junta of the UFT has continued to shunt aside any attempt to raise a resolution at the Delegate Assembly calling for opposition to the GHI/HIP privatization plan. Whereas the Unity Caucus rejected attempts by members of the opposition caucus ICE to hire independent investigators for teachers assigned to the DOE's gulag rubber rooms. Resolved that the government of the People's Republic of China will support all efforts to force the Unity Caucus ruling junta to establish glimmers of democracy. Would College Educated People Send Their Kids to KIPP? I spoke to someone today who insisted that teacher quality is a separate entity from conditions. I argued that TQ is very variable and dependent on things like class size, the type of students, the general conditions in the school. Even time of day - like most any teacher will agree that under equal conditions, they are more effective in the AM than in the PM. It makes sense since everyone is more tired. This is not to say that if you get your best class at the end of the day you won't be energized. Almost every teacher I talk to signs on to the quality teacher debate as if it's a digital concept: 0 if not a quality teacher, 1 if you are a quality teacher. I look at TQ as analog - it fluctuates on let's say a scale of 1-10. Now there may be some teachers who are in a range of say 5-7 generally and others might be a 3 -5. What we would hope for is some consistency. Would you want a 10 20% of the time who can float down to a 3 when he is depressed? (It does happen). Or a consistent 7? Of course the big bugaboo in all this: what determines the quality of a teacher? The ed reformers have only one response: results on high stakes tests with the added bonus of value-added which tracks the growth of a child over time and attempts to find what part in that growth an individual teacher had. They might as well rate teachers on the real growth of the child - how many inches taller they get the year you have them. "My class grew an aggregate total of 5 feet." BONUS! Can't you just see schools slipping human growth hormone into the milk and cookies? But let's go back to the TQ debate as if these factors didn't exist and we really had an effective ratign system that went beyond the test. 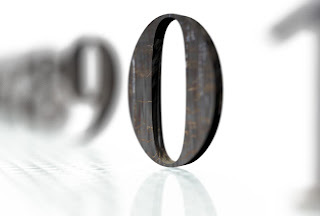 The 5% that many people agree that are at the low end of TQ - say 1 or 2 all the time are the main focus of the so-called reform movement that includes assaults on seniority and the union contract. Call it the "put a Quality Teacher in every classroom" concept. All this reform aimed at 5%. Like they are the ones responsible for an entire nation falling behind in the global economy. Give me a break. If principals could remove whoever they wanted tomorrow, these people would be replaced with a similar percentage of low quality teachers. Start off with the idea that first year teachers are lower quality than they will be in their 2nd year and 2nd year teachers are lower quality than in their 3rd -- oops! (Half the TFA people are gone before they get to the 3rd year.) Also assume a % of new teachers no matter how hard they are trying are just not all that competent in their first year. Given the numbers that don't finish the year, I bet it is higher than 5%. Thus, my theory that 5% of the entire teaching corps will fall into the lower end no matter what is done. As would a similar percentage of cops, doctors, lawyers, plumbers - you name it. I find it interesting that there's a witch hunt for teachers but not for bad doctors who have better than tenure - the AMA. Check out the ednotes analysis of the biased Education Sector teacher survey which didn't ask about the impact of class size because the Ed Sector is totally on board with the usual suspects on this issue. Read the Ed Notes post exposing some of the biased questions here. David B has broken the Ed Sector audio of the presentation of the survey on May 7 into 3 parts so you can listen to them in segments – if you can stand it. There were some teachers present, including one from a NYC middle school and the president of the Providence TU. ....John McCain would still be at the Hanoi Hilton. "Pssst. Have you heard? I have. I heard that Barack Obama once said there has to be “an end” to the Israeli “occupation” of the West Bank “that began in 1967.” Yikes! Pssst. Have you heard? I have. I heard that Barack Obama said that not only must Israel be secure, but that any peace agreement “must establish Palestine as a homeland for the Palestinian people.” Yikes! Pssst. Have you heard? I have. I heard that Barack Obama once said “the establishment of the state of Palestine is long overdue. The Palestinian people deserve it.” Yikes! Yikes! Yikes! Those are the kind of rumors one can hear circulating among American Jews these days about whether Barack Obama harbors secret pro-Palestinian leanings. I confess: All of the above phrases are accurate. I did not make them up. There’s just one thing: None of them were uttered by Barack Obama. They are all direct quotes from President George W. Bush in the last two years. Mr. Bush, long hailed as a true friend of Israel, said all those things. ...Personally, as an American Jew, I don’t vote for president on the basis of who will be the strongest supporter of Israel. I vote for who will make America strongest. Also, David Brooks' nuanced interview with Obama on Lebanon after the Bush appeasement attack. What Will the Tough Liberals in the UFT Do? Tim Daley: Do you want to hire me?